winter trade shows and then agonized over a $25K parking upgrade for years! and labor. So that’s where we start. we have the skill set to make money in that category? For years we have been asking these questions to clients and helping them come up with answers driven by real hard, cold facts and figures, rather than emotions. These facts and figures come from just 5 simple numbers we have tracked for over 12 years and this best-practice is now available to all independent garden retailers through our new “5 Numbers Project”. (Click here to see some sample dashboards). extra software, just 5 numbers and you’re done. Subscriptions for first round of The 5 Numbers Project – to compare with other retailers (anonymously) across the US are available ONLY until Monday January 7 … so it’s time to ACT NOW! For the price of a few racks of perennials or a couple of pallets of fertilizer, we will give you critical profitability and productivity information personalized to YOUR business. “Measuring What Matters” and comparing with others might be your best January investment, but you need to click here to subscribe today! Ho, ho, ho!! We’re thrilled with the uptake so far on subscriptions to The 5 Numbers Project, both in number and in caliber of companies. It’s a great mix of businesses large and small from all across the country. We’ve heard from some of our favorite elves out there that this season has been so busy … that you’re only just now having a moment to breathe and focus on the coming year. While our original (today) December 23 deadline for new subscriptions to The 5 Numbers Project was set up so you wouldn’t have to think about it over the holiday, it turns out some of you really LIKE using the quiet weeks after Christmas to think about ‘big picture’ things like this! So by popular request, as a gift to ALL OF YOU who have made the holiday so merry for others this year, we’re happy to extend the subscription deadline until January 3, 2019. (Early January is important though, so we can get all new subscribers onboarded and your personal dashboards built so you can effectively be tracking by the time first numbers are due in – Feb 15-21, 2019). So if you haven’t yet had a moment to take a look at the SAMPLE DASHBOARDS and get yourself subscribed into the system (if you’re a GCU Alumni firm, check your email for a discount code!) – there’s still 2 weeks to make that magic happen, giving yourself the gift of BETTER PROFITABILITY in 2019! For today, Lisa and I, together with Kellee and the entire Your MarketMetrics – 5 Numbers Project Team wish you a Merry Christmas and a wonderful end of 2018! We are excited to launch this landmark industry benchmarking initiative with all of you in 2019. Between 65% and 80% of all the money that independent garden retailers receive as Sales Dollars is spent within the next few weeks or months on just two aspects of running the business: Inventory and Labor. So yes: Labor Dollars is a BIG important number! The range of labor costs as a percentage of sales in all types of retail can range from the low single digits of a warehouse “club” to the high 20%s, even the low 30%s in a lavishly, full service, up-scale store (the sort of place you have to ask them to let you in…). The range in a typical independent or local garden retailer can be from 15% of sales to the high 20s, depending on the service model and the competency of the management. A Burden Or An Investment? But as you’ve heard me say, dollars pay the bills, not percentages, so let’s look at what that means in real numbers. When we talk about the labor bill (and when we track it in the 5 Numbers Project), we are taking about the whole cost of labor, not just the wage the employee gets. The “human” costs of employing others (sometimes called “Burden”) are unknown to many employees. Well, unless someone told them, how would they know anyway? I didn’t when I was an employee. So the rise in labor dollars is something we are closely following, especially in a good economy when employees have some leverage to bargain with. Just from watching the trends of this one number, questions emerge: Is our rise in labor dollars more or less than our rise in what pays for it, i.e., Sales Dollars? Are Gross Margin dollars going up quicker than Labor Dollars and if not, how do we make that happen? So, as you can tell, we do watch all these numbers very closely. As Labor Dollars are the second biggest cost after Inventory (and exponentially more than the marketing budget! ), we especially track the trends and changes in this one. Click here to learn more about The 5 Numbers Project: a national initiative to create valuable benchmarking & visual dashboards that will increase profitability for independent garden centers. And stay tuned for the last of the 5 numbers – Labor Hours – next week. I am always a little surprised at the number of owners and managers who DON’T track or even think about this metric. Surely just from a Return on Investment in marketing aspect it should be one to watch. Savvy operators are currently using this metric trend to see what effect the switch from traditional media marketing to social media marketing is having on the number of shoppers coming in the door. The number of customers who volunteer to spend their precious time and money at your store is first and foremost a reaction to the company’s value proposition. It’s the public’s response to your marketing, promotions, reputation, drive-by appeal or their previous shopping experience. It’s the public’s “secret shopper” report – every day. Just for starters, a history of customer count by the hour is very useful for team scheduling so you don’t have 5 employees gathered round the register at 8.00am, but only two out selling in the after-school rush at 4pm! Customer count is influenced by outside events or circumstances and any record of it must also have a note of the business conditions in that time period. If it rained heavily this week last year or there was a major ball game on TV that weekend last year, managers should know before they react to the number. If customer count is going down, it might mean a marketing challenge to recapture lost traffic or stimulate new shoppers to try your offer. In that case budgets should be geared to boosting external messages, marketing, image, exterior remodeling, building community relations and so on. If customer count is going up, you may have a sales and merchandising challenge serving and inspiring all those extra people to spend while in your store. In this case, budgets should invest in more internal resources for improved hiring, training, buying, merchandising, silent selling and just generally helping customers spend more. Next week, we’ll tackle the third of The 5 Numbers as we gear up to open subscriptions in the Project (*T5NP) … stay tuned! Traveling the country working with independent garden retailers, I know that owners and managers constantly wonder how their year compares with that of their peers 300 or even 3000 miles away. The fear of falling behind industry standards is understandable when you are working hard in your own trenches! It’s easy to feel isolated. I get asked, “what are you hearing this year, how are others doing?” a LOT. As I mentioned in my last post (9-2-18): the good are getting better and winning market share from the less successful. For many years we have focused our business on helping our clients use the numbers that really matter. While there’s a lot more to success than just a few data points, most of the winners do in fact use just a few data points to make the good decisions that keep them winning. That’s their “secret sauce”! Now that almost everyone has POS, too much info can be the problem, not too little. Data is available on every aspect of the company, from buying strategies to performance reviews. Owners and managers simply don’t have the time to clarify what is crucial from what is just interesting! So they either don’t use the data although they have it, or they get buried in the wrong data. Unless you are going to invest in extra staff to track and analyze all the data, it just puts more work on the same few people. So how do owners and managers decide which data points matter most? Simply, they let us help: we have narrowed the answers down to just 5 Numbers each month. These, together with a few simple but crucial “offspring” calculations, allow retailers to make the right decisions without more office time and endless reports. Some of our clients have been using this approach for over 10 years and are absolutely “beating the street” when compared against the industry in general. We focus on what matters most in retail. With 60% – 80% of sales revenue being spent on just two costs, inventory and labor, we keep the “numbers” where they matter for time-crunched owners and managers. From just 5 Numbers our clients can track sales and/or customer growth, margin management, customer spend, labor efficiency and retail profitability. But unlike traditional industry reporting, which focuses on the topline of Sales Volume, we go down much deeper to see what’s left after inventory and labor costs, or “Gap Dollars” for those in the know. Gap Dollars, (accountants might refer to it as ‘Margin after Labor’) is like an operating profit. By subtracting the costs that you have quick and relatively easy control over (like Costs of Goods and Labor) from sales, you can see what’s left to pay those expenses which are hard to reduce such as rent, admin, energy, debt repayment and so on. If that particular number, Gap Dollars, is not increasing faster than the cost of being in business, you’re going backwards no matter what the topline sales numbers tell you! Share and Compare – Finally! You may be aware that Dr. Charlie Hall (Texas A&M) has recently launched a national key performance indicators sharing network for growers. 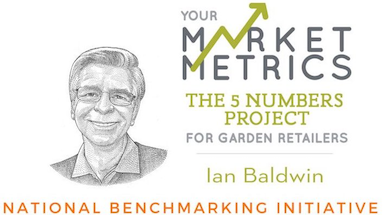 We are using the same platform (yourmarketmetrics.com) to create “The 5 Numbers Project” (T5NP) for garden retailers: secure, online, anonymous business comparisons, available at your desktop 24-7. What’s the goal here? We believe there is a strong desire to have credible national industry data to compare with to see how the industry is doing as a whole, and to track your OWN business’ performance in a visually compelling way that speaks to people beyond the beancounters. We want you to have a confident answer when your loan officer says, “How do you compare with the industry?” or when you are trying to value your company for sale or generational transition. Best of all, the dashboarding format will give you an easy way to visually SHOW your team the metrics you want them to focus on … so they can help you move the needle where it matters most. Importantly: ALL independent garden retailers are welcome to join this new industry-wide benchmarking project, regardless of what peer group, buying group or networking group you already belong to. All are welcome … as long as you’re a retailer. (We love our vendors, but unless you have your own garden retail numbers to share (ANONYMOUSLY, of course), then this isn’t the project for you. The first round of subscriptions will be open only from November 1 – December 23, so you can be onboarded and up to speed before Spring 2019 hits. Every Tuesday for the next 6 weeks here on Bits & Bobs, we will feature one of the 5 Numbers and what it can do for you, and share more about how the platform will work: stay tuned!